Learning to close a wound. An environment to explore the exciting world of health and careers in medicine. Our students have the opportunity to role play, learn and explore healthy living and careers in the medical field. As the world’s population continues to age, the need for skilled health professionals is increasing. 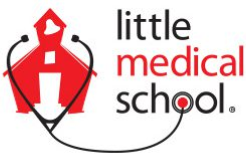 Little Medical school strives to play a big role in the solution to this problem by teaching children as young as age five how fun the world of healthcare can be. An experience for elementary school children to role play and explore the exciting world of veterinarians. Using interactive demonstrations, crafts and games, kids learn how to take care of a pet and use instruments that real veterinarians use. Little Veterinarian School® brings medicine, science and the importance of health to children in an entertaining and engaging way.